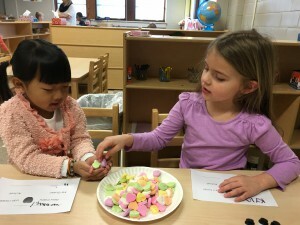 This week the preschooler’s in Mrs. Hauber’s class have been having fun using candy hearts for math skills. They worked on patterning, graphing, and estimation. Each student estimated how many hearts they could hold. Then they each counted out hearts and put them into their partner’s hands to see how many the could actually hold. They compared the numbers they had estimated they could hold to what they could actually hold. To see several more pictures log onto the Perry Township Schools Facebook page.